Most runners believe a good pair of running shoes is worth the investment. But advances in running shoe technology have sparked debate about whether shoes help you run faster. Can they really allow marathon runners to break the elusive two-hour barrier, a challenge set to take place in Italy this weekend? Or can newer shoes help you improve your personal best? If they do, can we class these shoes as “performance enhancing” technologies that give runners an unfair advantage? The weight of your running shoes can have a significant impact on running performance. As shoes get heavier, muscles use more energy to move your feet, causing you to fatigue earlier, reducing your running performance. Advances in materials technology have allowed running shoes to get lighter and lighter. Premium running shoes weigh on average 250 to 340 grams each, while the controversial Nike Zoom Vaporfly Elite tips the scales at just 184 grams. If shoe weight is so important, why not run barefoot? Running barefoot requires energy to be absorbed by the muscles of the legs and feet when the foot hits the ground. Shoe cushioning can alleviate some of that. However, adding cushioning also increases shoe weight. So, there is a trade-off between the benefit of cushioning and the detrimental effects of added weight. A recent study found running in shoes each weighing 211 grams resulted in the same energy consumed for a given running distance (called running economy) as running barefoot. And running barefoot on a treadmill, that provides the same cushioning as shoes (without adding weight to the feet), produced a small (~1.6%) improvement in running economy. So the ideal would be to provide enough cushioning with as little weight as possible for the best running performance. Reducing muscular effort at impact through shoe cushioning can be beneficial. But traditional running shoes lose energy with every step (converted mainly to heat). So, this energy must be replaced, through muscular contraction, to propel the runner into the next step and prevent a drop in speed. In fact, cushioned shoes increase activation of foot and leg muscles during push-off, compared to barefoot running. So the benefit of cushioning during impact may be offset by the increase in muscular effort needed to push off. What if we could get back the energy lost at impact? Recent developments in running shoe design have focused on developing lightweight cushioning materials that act like springs to store energy from foot impact and return it to help power push off. In theory, this could reduce the muscular effort required to both absorb impact and power push-off and potentially improve running economy. But there are complications we must consider before “springing” to a conclusion. Springs only return energy they absorb when the shoe hits the ground. Springs cannot generate the extra energy needed to run uphill or accelerate. So muscles must still do this extra work and we do not yet know how a spring influences their ability to do this. This may potentially affect how efficiently you run uphill, downhill, accelerate or slow down. The way the foot moves is also important. Our toe joints naturally bend when we push off, which dissipates some of the energy added by calf muscle contraction. 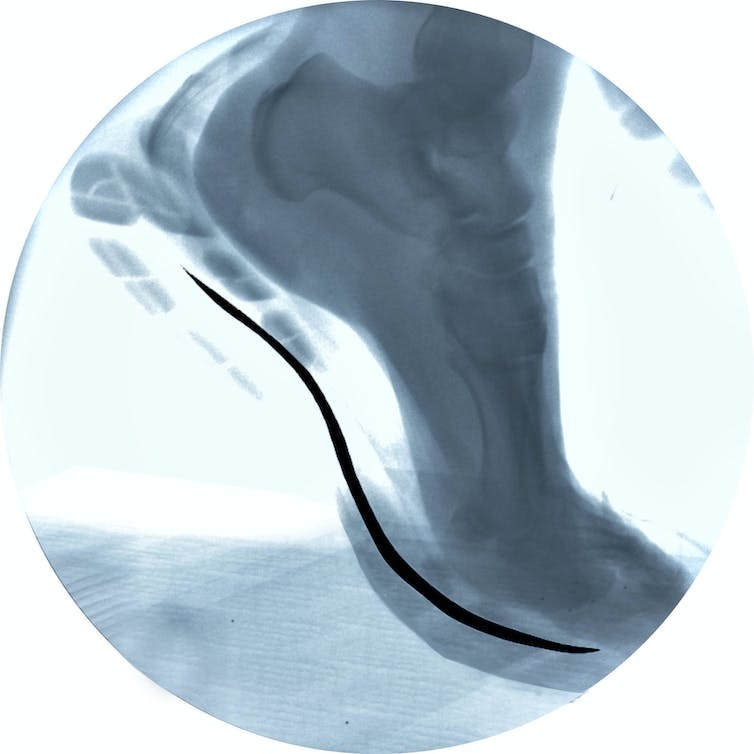 High speed x-ray of running foot during push-off, when the toes bend and absorb energy. A hypothetical carbon insole is shown, which should theoretically reduce how much the toes bend and therefore reduce energy lost. Author provided, with Mike Rainbow, Susan De'Andrea and Nicolai Konow. Reducing the amount the toes bend by making shoes stiffer can reduce the amount of energy lost. Stiffer soled shoes can improve running economy, but only if the bending stiffness is optimised for the specific athlete. Too stiff and the calf muscles have to work too hard to produce the required forces to rotate the ankle; too soft and the benefit becomes trivial. So it is not surprising shoes Nike is preparing for running marathons in under two hours have carbon fibre insoles where the bending stiffness is “tuned” for each runner. The optimal stiffness of a shoe sole also varies depending on factors like the runner’s weight, leg length and strength. But a bigger design problem is that the optimal bending stiffness also varies with constantly changing factors. Running at different speeds means we must change how we activate our muscles. But a simple spring, such as the carbon fibre blade, cannot change its stiffness for different speeds. Even if we could tune shoe stiffness as we ran, this wouldn’t help with the added effort required to run uphill or accelerate. Are shoes ‘performance enhancing’ devices? Advances in shoe technology have the potential to improve running economy. At most, it is estimated this might make a difference of up to 2% in running economy when running on a flat course, in ideal conditions. For professional runners, we don’t think the latest improvements in design provides an “unfair” advantage because the shoes do not give runners extra energy; they only help preserve energy our muscles generate and are likely to require precise conditions to be effective. While recreational runners may get a small performance benefit from lighter, better cushioned or slightly springy shoes, they would be better off increasing their fitness, and making sure their next shoes are comfortable and fit to reduce the chance of injury. Glen Lichtwark, A/Prof in Exercise and Sport Science, The University of Queensland; Dominic Farris, Research fellow, The University of Queensland, and Luke A Kelly, Research Fellow, The University of QueenslandThis article was originally published on The Conversation.